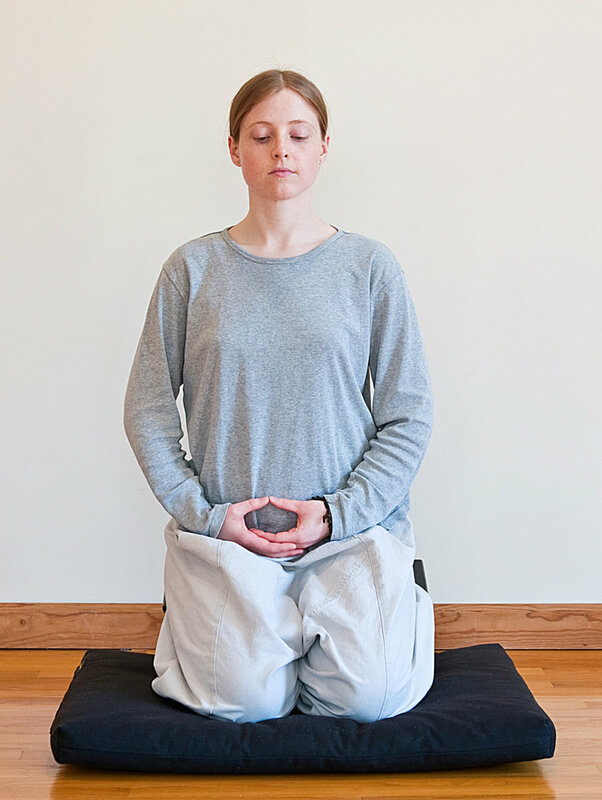 As our School comes from an Asian tradition, the basic meditation posture is to sit on a mat and cushion on the floor. For Westerners who are used to sitting in chairs, this can often cause discomfort. For this reason, our School allows for many variations to help students find a stable and comfortable posture for sitting meditation. There is absolutely no esoteric significance to the different positions. What is most important in sitting meditation is what we call mind sitting, rather than body sitting—how do we keep our mind just now? In order to do that, a good posture is useful and supports our practice. Using a chair. When sitting on a chair, your feet should not extend past the front edge of the row of mats in the row in which you are seated in a group practice setting. You may fold your mat and place it under your chair. You may use the mat for a footrest. 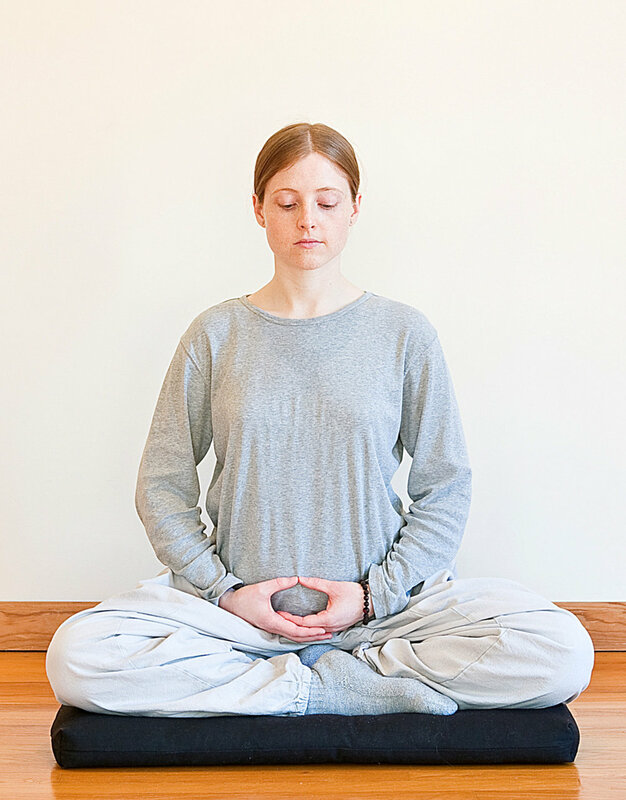 For meditation purposes, it is best that you do not lean against the back of the chair, but sit toward the front of the seat, keeping your back erect. Your thighs should be parallel to the floor, with shins perpendicular. Both feet should be parallel, flat on the floor. Straddling cushions. Stack several cushions on top of one another, straddling them as if riding a horse. Using a meditation bench. Meditation benches have a slanted seat with two legs. First kneel on your mat, then position the bench over your calves behind you, and sit. 2. Keeping your spine straight and shoulders back and loose, tip your head forward very slightly, looking down at the floor at a 45-degree angle. 3. Your eyes should be half open, looking at the floor in front of you. 4. 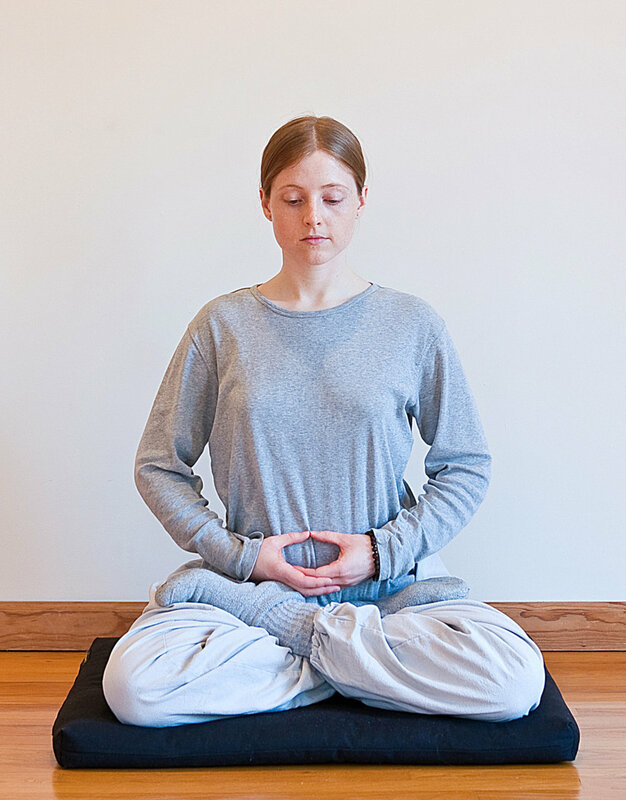 Place your hands in your lap in the maha mudra (see Hands below for full description). When sitting cross-legged, both knees should rest on the floor, though sometimes it takes a bit of time to be able to get the legs to drop that far. After a while the muscles will loosen up and the knees will begin to drop. To help that happen, sit on the front third of the cushion and adjust the height, shifting your body forward a little bit. The three points: the base of your spine (rear end) and both knees should touch the mat for stability. By imagining the top of your head pushing upward to the ceiling and by stretching your body that way, get your spine straight—then just let the muscles go soft and relax. With the buttocks up on the cushion and your abdomen naturally pushing out a little, there will be a slight curve in the lower region of the back. In this position, it takes very little effort to keep the body upright. Once you’ve positioned yourself, there are a few other things you can check on. The mouth is kept closed. If possible, breathe through your nose. The tongue is pressed lightly against the upper palate. This reduces the need to salivate and swallow. The eyes are kept lowered, with your gaze resting on the ground about 70 to 100 cm in front of you. Your eyes will be mostly covered by your eyelids, which eliminates the necessity to blink repeatedly. The chin is slightly tucked in, so that your head is tilted down at a 45 degree angle. 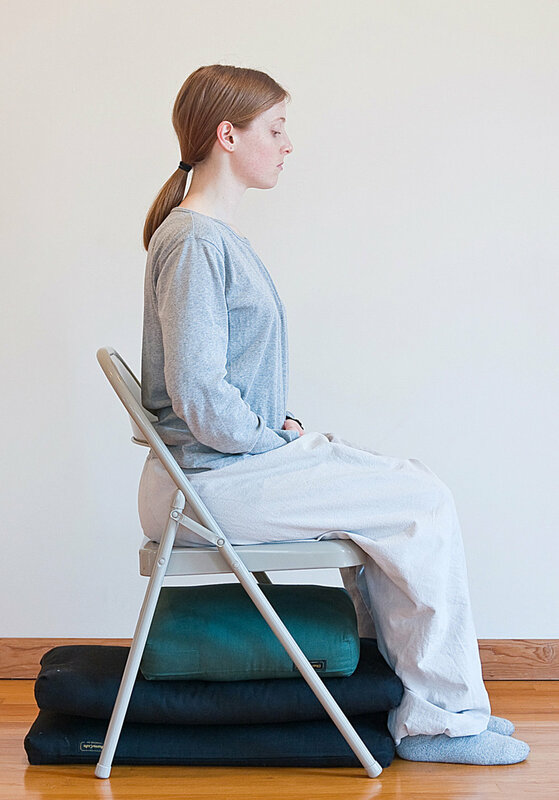 Although the position during sitting meditation looks very disciplined, the muscles should be soft. There should be no tension in the body. It doesn’t take strength to keep the body straight. The nose is centered in line with the navel, the upper torso leaning neither forward nor back. 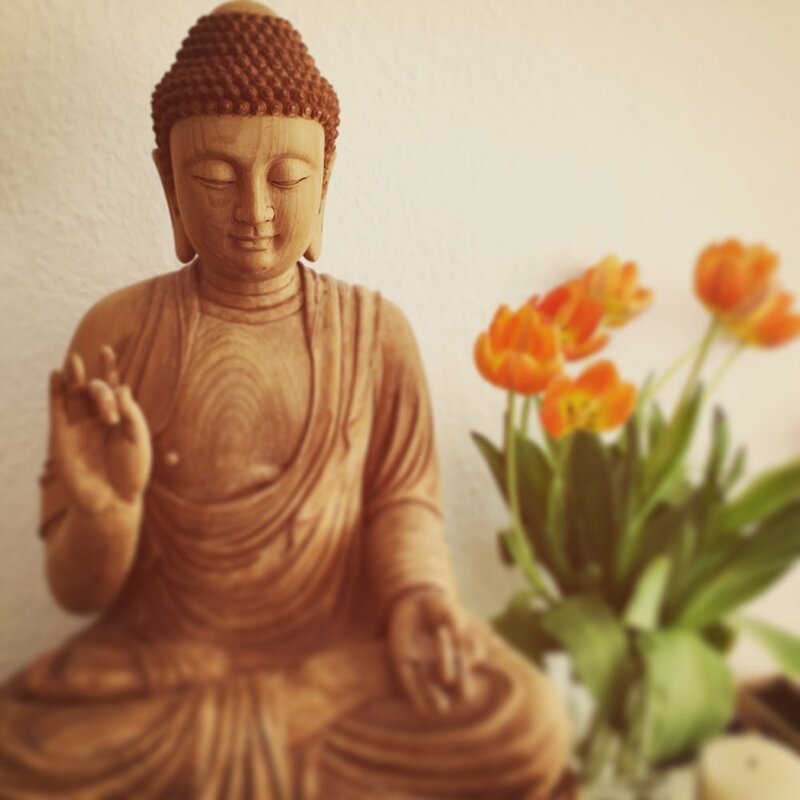 The hands are folded in the maha mudra. The dominant hand is held palm up holding the other hand, also palm up, so that the knuckles of both hands overlap. The thumbs are lightly touching, thus the hands form an oval, which can rest on the upturned soles of your feet if you’re sitting full lotus. If you’re sitting Burmese, the mudra can rest on your thighs. The center of the cosmic mudra should be exactly in the place of your energetic center—danjeon (Kor. ), hara (Jap.) or tantien (Chi. )The positioning of the hands helps turn your attention inward. Paying attention to your breath is the basic foundation for meditation. Our breath is always with us, anytime, anywhere. The word “spirit” means breath. By breathing correctly, you can access “gong-ki” (Kor. )—air energy. How you breathe affects your body and mind: when your mind is agitated, your breath is agitated; when you’re nervous, you breathe quickly and shallowly; when your mind is at rest, the breath is deep, easy, and effortless. During meditation, we encourage you to inhale and exhale through the nose and generally exhale twice as long as inhale, e.g. 3 seconds in, 6 seconds out. 5 seconds in, 10 seconds out. Breathing should be done naturally, not forced or with concentration. During sitting, it is also important to breath quietly, without making noise as it can distract others. Most important is to let your breath become relaxed and naturally at ease. It is important to bring your attention to your center—danjeon (Kor.) tantien (Chi.) hara (Jap.) Your center is located two inches below the navel at the central axis of your body, and is the exact middle point if measured from the top of your head to the bottom of your feet. It’s the physical and spiritual energy center of the body. Put your attention there during your practice. 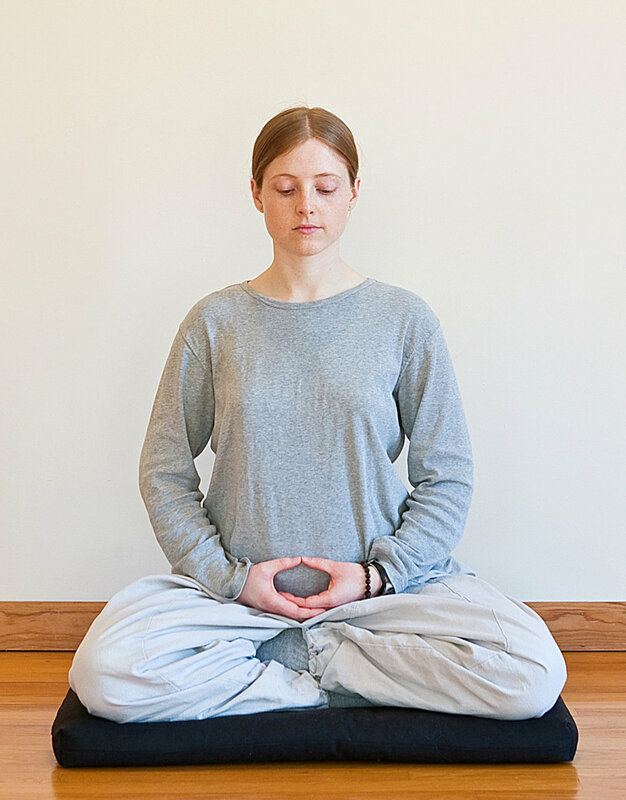 As you practice sitting meditation more, you’ll become more aware of your center as it becomes stronger. In Zen we say, “This is your don’t know center”, the center of our ‘just do it’ energy, or willpower center. Once in a particular sitting position, you should stay that way until you feel the need to change positions. During a sitting period, if physical pain or drowsiness becomes a distraction, you may stand up for relief. First, do a sitting bow, then quietly stand up, remaining in standing meditation until the discomfort passes. When you are ready, do a standing bow and quietly sit down. 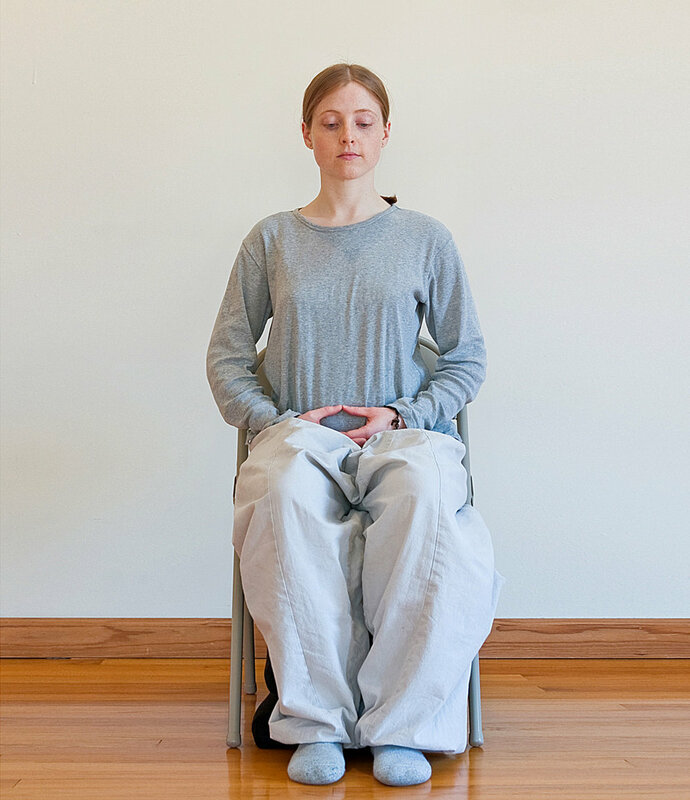 Additionally, you may use the standing meditation posture as a transition between different sitting positions. For example, if you experience a lot of pain sitting cross-legged and need to change position, do a sitting bow, stand up quietly, bow, and then sit down in a kneeling position. What you do with your mind is the most important part of meditation. Zen means understanding your true self—what am I? In order to do that, meditation techniques help us to become clear in the present moment. Below are some simple basic techniques that can start you off with a meditation practice at home. For detailed instructions, please visit one of our Zen centers for an orientation. This exercise is usually suggested for beginners. When you inhale, repeat quietly inside your mind, “clear mind, clear mind, clear mind” and as you exhale, say, "don’t know". Your exhalation with “don’t know” should be drawn out about twice as long as your inhalation. It may be unfamiliar at first, but if you gently pay attention to each breath and be aware of the words being repeated, the exhalation will slowly become longer and more relaxed. If thinking or emotions appear, that’s not a problem, just return to your breath and the simple exercise. This technique bring together body, breath and mind in one place, in the present moment. When the words are clear, and you are aware of your breath and can feel your body, then your mind is clear. You can try this method for 10 minutes each time during sitting and if comfortable, extend to 20 or 30 minutes. This practice, often recommended for beginners, brings attention to each breath and helps to still and focus the mind. The count may be done on either the inhalation or exhalation. The count is done either up to three or up to ten and then repeated for the duration of the sitting period. If the count is lost, then the practitioner returns to one and starts again. 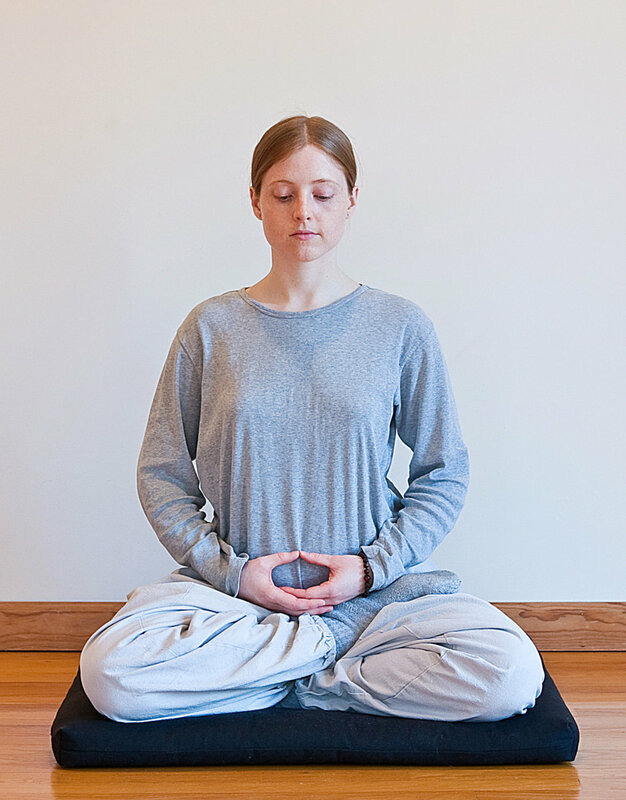 Using a mantra to calm the mind and strengthen the center is another technique used by Zen practitioners. A mantra is a tool to keep our mind clear, while sitting or doing our everyday moment to moment activities. A common mantra to use is repeating “Kwanseum Bosal” (Kor. for Bodhisattva of Compassion), the Buddhist name for the emanation of our own compassionate heart. The usual technique is to recite the mantra quietly to oneself, repeating it constantly, paying attention to it and allowing all other thinking to drop away. This takes some practice since it is very easy to let one part of the brain “chant” the mantra while the other part is thinking about dinner or going to the movies. When this happens, gently bring the mind back to the mantra without any judgement. When doing mantra practice, it is important to make your direction clear. When the mantra is not clear or there is a lot of thinking, simply ask, “who is repeating this mantra?” This will help bring you back to the present moment and become clear. During sitting, when your mantra is clear, your breath is even and natural, you are aware of your body and you see the floor clearly in front of you, then your mind is clear. 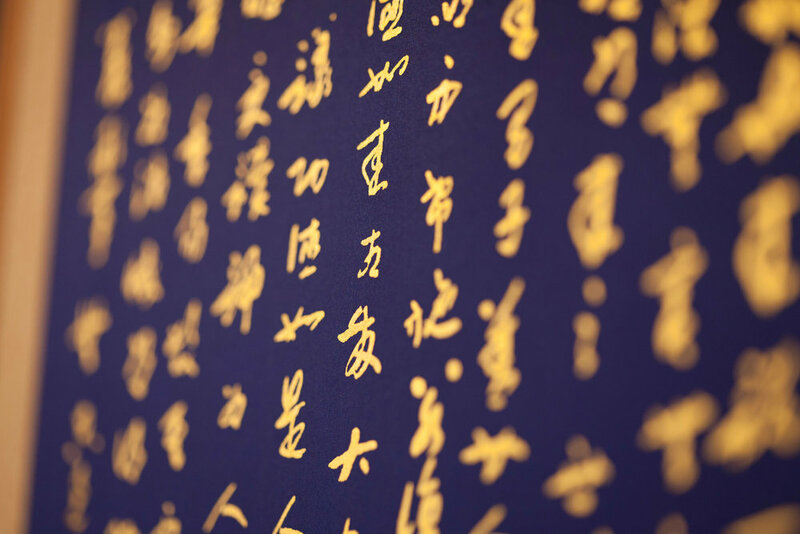 For doing mantra practice, we recommend you consult your guiding teacher.